Coming soon: Sweet Brown scented candle? This photo, which has been circulating online, is of a doctored Yankee Candle jar that’s had everyone’s favorite news interviewee, Sweet Brown, superimposed over a photo of a campfire. 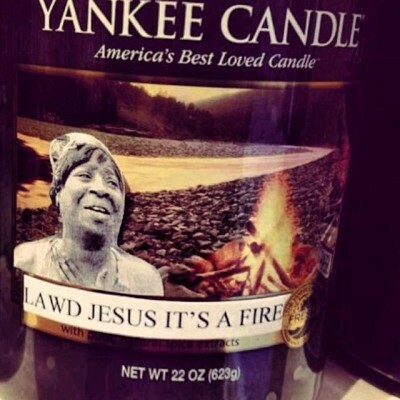 A label reading “Lawd Jesus It’s a Fire” has also been added. Find out if the candle is available for sale on Amazon. Brown, as you may recall, is also the star of a series of dental commercials. And, if you can’t get enough Sweet Brown, here’s a link to the video that made her famous.